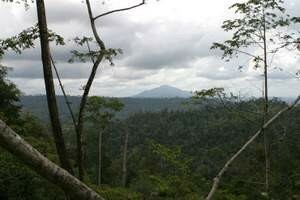 The Meratus Mountains are located in the southeast corner of Borneo; part of the Indonesian East Kalimantan province. Thirty years ago they were a remote place, but a USA/Indonesian consortium had ambitions to change that by exploiting the potentially enormous coal reserves near the surface, first noticed by the Dutch. Our Sydney consultancy was asked by the consortium to map the geology along the northeast side of the Meratus. There were only two of us from Australia: we intended to recruit our surveying teams locally. Dave bravely tackled the notoriously bureaucratic Jakarta police department to get passes to other islands, while I lounged around the Hilton Hotel pool waited on by slender girls with flowers in their black hair. Some preparation for slogging through the tropical rainforest, I thought. We eventually got our “papers” and a flight to Banjarmasin, on the south coast, where there were very few non-Indonesians. From there an ancient light aircraft took us to Kotabaru, an island off the south eastern corner of Borneo where the project’s field HQ was established. At the end of the dirt airstrip the remains of some of the previous flight could be seen hanging from the trees. Our pilot managed to stop before joining them despite the heavy rain and the distraction of chickens fluttering about the cabin. Wailing loudspeakers replaced the din of the old aero engine because Ramadan had just begun. At the consortium confusion reigned as the project was struggling to get going. 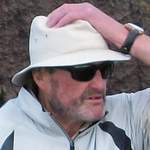 However, Dave, in his own shambling way was adept in such situations so soon got our field assistants recruited and equipment assembled. All we needed then was a helicopter to shuttle our expedition to the Meratus Mountains. Our plan was to traverse the forest up the east side of the mountains from one base camp to another by “chopper” because there were no roads, only a few old Korean logging tracks submitting to the vegetation. We thought a week would be long enough at each camp. Our chopper pilot, an unusually brash and self-important Indonesian in a red jumpsuit soon had us established at camp one by a river in the southern Meratus. We had plenty of assistants, but they were from the large coastal towns where there was still widespread fear of the Interior. This became the cause of our survey delays: on a typical day Dave and I would lead separate survey parties through the forest, hacking our way from one stream to the next, as the riverbanks were the only places we could inspect the geology. If we found coal floating down we knew there was a coal outcrop upstream; if no coal, we would follow the stream downhill. Although it was easier to walk up and down the rivers than struggle through the undergrowth we were pestered by leeches and water snakes. Progress in the forest was further hindered because the leading boys insisted on cutting a path so wide that I was assured no inconvenience by even a solitary twig. However, it quickly became obvious that the crew were less concerned with my welfare than going as little distance as possible from the camp. They had a mortal fear of still being in the forest when the sudden tropical darkness fell; they thought that “evil spirits” lurked in the dark green depths. We had a tight schedule to map our section of the exploration area, so had to get rid of the fearful ones – I was left with only a few older boys who sported bandanas and maintained a grim silence. Progress was also swifter during diversions up the higher slopes of the Meratus where the forest was less dense. From one of these ridges I once saw an orang-utan swinging inelegantly across the forest canopy below. On another occasion, when I was down to one assistant I pushed on up a river trying to find a critical geological boundary although I knew it would be too late to return to camp before dark. On the way back we luckily stumbled on an old logging track which, according to my compass, led roughly in the direction of camp. Mysterious noises emanated from the forest as we trudged along in bright moonlight. To my companion’s great relief a 20th century noise grew louder – it was Sopomo on a trail motorbike looking for us. Naturally, he took his compatriot away first which left me walking alone through the forest which was bathed in wonderful shades of silver (an unforgettable experience). But less enchanting times awaited me on this project. At one of our rare fly camps, Dave and I were washed out of our tent at night by a violent tropical storm. Among other things our medical box containing anti-malaria drugs floated away in the darkness. Back at base camp it soon began: the raging fever, the hallucinations, the freight train crashing through my head. Dave had had malaria before and was alerted to despatch a runner with a message to a coastal police station to radio our HQ for my evacuation by helicopter. In those days the survey teams had not been issued with radios, so there was no way of directly contacting Base. In the message, Dave referred to “one of our party” with severe fever which was interpreted as one of the Indonesians, and the pilot was not making a special trip for that. Under the crazy interference patterns of the mosquito nets I deteriorated close to dying when, days later, the chopper clattered into the edge of my consciousness on the usual scheduled supply drop. The Red Jumpsuit became excited at an emergency and attempting heroic status flew me over the Meratus, in another storm, to The Hospital of the Spirit of Humanity at Banjarmasin. The Filipino nuns whose dedication kept the ramshackle hospital going rarely entertained Europeans, so a concerted effort was made to keep me alive. They even called in an Indonesian doctor whose incompetence almost killed me a second time, but the nuns urged me not to die because the morgue was already overflowing from a cholera outbreak in the city. They had considerately put me in a “first class” room, which when the fever subsided I discovered was infested with huge black rats. I wondered what the other classes of accommodation contained, located in a swamp as the hospital was. I was too grateful for cheating death to complain about the rats, but did object to an endless stream of staff (and others) curious to see a European. So the sister put a warning sign on the outside of the door. I never discovered what it said, but from then on I had only the flies and rats for company. Anyway the nun nurses had pulled me through and eventually I was well enough to return to Jakarta, recuperating at the Hilton Hotel. I spent the time waiting for Dave reading Duncton Wood and being waited on by the Girls with Flowers in Their Hair. By then I thought that Indonesia, except for its reek of clove cigarettes, was not such a bad place after all. The consortium eventually gave birth to the largest energy concern in the archipelago, partly due to our minute contribution in the beginning. When Dave returned from Kotabaru we flew on to Sydney, leaving the Hilton and the deep green rainforest far behind – but never to be forgotten.